To animate an image is not just to imitate life. In the age of digital imaging and virtual realities, the three selected animations are a product of our fascination with movement and metamorphoses, giving free rein to whit and fantasy. A roguish flirtation with the history of art, Kunstbar (2002) was mastered by a team of conventional cartoon animation creators, The Petrie Lounge. 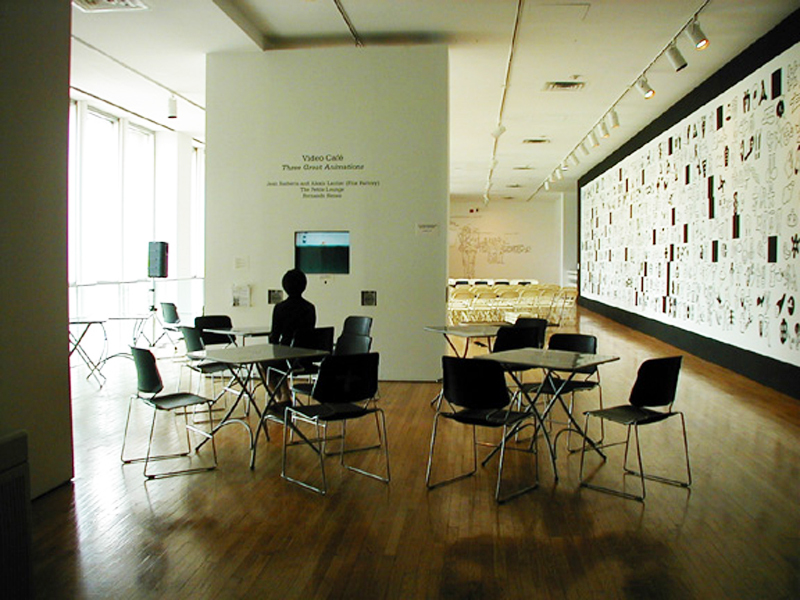 Le Tour de QMA (2002) by Jean Barberis and Alexis Lautier (Flux Factory) bridges fiction and non-fiction in their hilarious stop-motion sequences of photographs, while Fernando Renes rigorously compiles hand-drawn pictures as a self-portrait in Couch Grass (2000). Couch Grass, 2000, color, silent, 10:08 min. In his first animation, Fernando Renes constructs a clip from his life assembled through a dense compilation of thousands of drawings. An encyclopedic medley of bits and pieces from the artist’s inner life, Couch Grass does not tell a story, it outlines as a self-portrait. Renes’ animated thoughts illuminate the random nature of one’s psychic life in which the emotional and physical realities sinuously morph into each other. Le Tour de Q.M.A., 2002, stop-motion animation, color, sound, 2:27 min. Sometimes art is best experienced at top speed on one’s stomach. Le Tour de Q.M.A. captures two men traveling through the museum on their belly. While each frame is sharply focused with a digital camera, the cranky stop-motion creates a good old-fashioned cinematic illusion that makes improbable acts and motions believable. Watch them dash and slither through the galleries, café, offices and backdoors of the Museum! Kunstbar, 2002, Flash animation, color, sound, 3:30 min. Five friends, experts in the tradition of animation, concoct a batch of cocktails named after Picasso, da Vinci, Pollock…. The hallucinatory adventure begins against the metaphysical backdrop of a de Chirico painting. A man wanders into the Kunstbar (art café) oblivious that his cocktails are infused with master pieces. Watch out for the Bosch drink! Kunstbar has been shown in numerous international venues including the Sundance Online Film Festival (2002).